DETROIT -- Infiniti is counting on the big-wheeled twin-turbo Q60 Concept coupe to become one of the brand's four biggest-volume models. 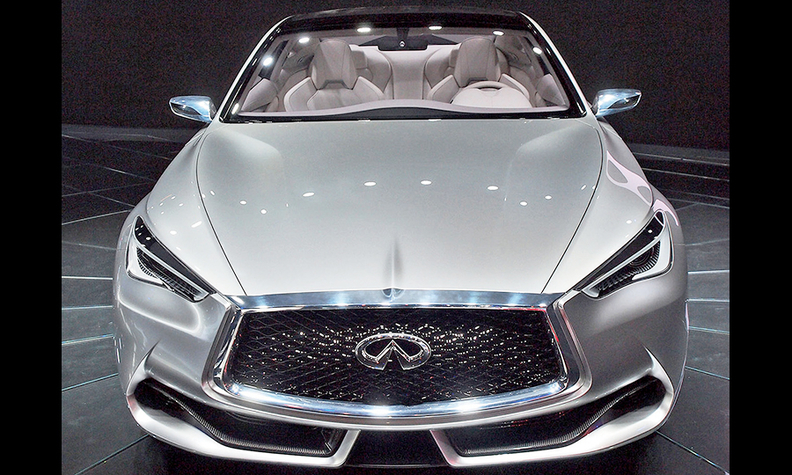 The Q60 will go into production in early 2016, staying close to the design of the concept car unveiled at last week's Detroit auto show, says Shiro Nakamura, Nissan's global design chief. The two-door coupe incorporates design cues from the automaker's attention-getting 2009 Essence design concept, with heavily creased body sides, an oversized front grille and accentuated 21-inch wheels. Michael Bartsch, vice president for Infiniti Americas, says the Q60 will step into the slot formerly occupied by the G37 coupe, a nameplate that averaged 14,000 sales a year over its 12-year run. "This car will become one of the brand's four cornerstones," he says "There will be the Q60, Q50, the new Q30, which comes soon, and the QX60 crossover. "There are 170,000 people out there who bought the previous coupe and may buy the new one," Bartsch says. "That's a huge opportunity for us." The G37 coupe still is sold in small numbers through Infiniti retailers but will be phased out this summer, he says. 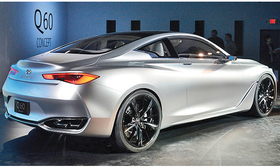 Infiniti plans to give the new coupe a 3.0-liter, direct-injection, twin-turbocharged V-6 engine. That newly developed engine also has been proposed for a larger future model, the luxurious fastback Q80 Inspiration concept displayed at last year's Paris auto show. "This is an important car for Infiniti," Bartsch says of the Q60. "This is a legacy car for us. And it will show our customers that we are continuing on with the bold design look of the Q50 with this and other cars to come."